(Nanowerk News) University of California, Berkeley, scientists have found a way to overcome one of the main limitations of ultrasound imaging – the poor resolution of the picture. Everyone who has had an ultrasound, including most pregnant women, is familiar with the impressionistic nature of the images. One of the limits to the detail obtainable with sonography is the frequency of the sound. The basic laws of physics dictate that the smallest objects you can "see" are about the size of the wavelength of the sound waves. For ultrasound of deep tissues in the body, for example, the sound waves are typically 1-5 megahertz – far higher than what humans can hear – which imposes a resolution limit of about a millimeter. This 3D holey-structured metamaterial can improve the resolution of sonagraphy by a factor of 50, promising better picture quality for ultrasound imaging as well as sonar. In a paper appearing online this week in the journal Nature Physics, physicists at UC Berkeley and Universidad Autonoma de Madrid in Spain demonstrate how to capture the evanescent waves bouncing off an object to reconstruct detail as small as one-fiftieth of the wavelength of the sound waves. Evanescent sound waves are vibrations near the object that damp out within a very short distance, as opposed to propagating waves, which can travel over a long distance. "With our device, we can pick up and transmit the evanescent waves, which contain a substantial fraction of the ultra-subwavelength information from the object, so that we can realize super-resolution acoustic imaging," said first author Jie Zhu, a post-doctoral fellow in the Center for Scalable and Integrated NanoManufacturing (SINAM), a National Science Foundation-funded Nano-scale Science and Engineering Center at UC Berkeley. The researchers refer to their device for capturing evanescent waves as a three-dimensional, holey-structured metamaterial. It consists of 1,600 hollow copper tubes bundled into a 16 centimeter (6 inch) bar with a square cross-section of 6.3 cm (2.5 inches). Placed close to an object, the structure captures the evanescent waves and pipes them through to the opposite end. In a practical device, Zhu said, the metamaterial could be mounted on the end of an ultrasound probe to vastly improve the image resolution. The device would also improve underwater sonography, or sonar, as well as non-destructive evaluation in industry applications. "For ultrasound detection, the image resolution is generally in the millimeter range," said co-author Xiaobo Yin. "With this device, resolution is only limited by the size of the holes." In the researchers' experiments, the holes in the copper tubes were about a millimeter in diameter. Using acoustic waves of about 2 kHz, the resolution of an image would normally be limited to the wavelength, or 200 millimeters. With their holey-structured metamaterial, they can resolve the feature size as small as 4 mm, or one-fiftieth of a wavelength. 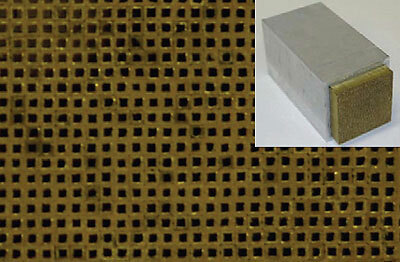 "Without the metamaterial, it would be impossible to detect such a deep sub-wavelength object at all," Yin said. The work was performed in the laboratory of Xiang Zhang, the Ernest S. Kuh Endowed Chaired Professor in the Department of Mechanical Engineering at UC Berkeley and the director of SINAM. The experiments were based on theoretical predictions of the group led by Professor Francisco J. García-Vidal of the Universidad Autonoma de Madrid. Other co-authors of the paper are J. Christensen of the Universidad Autonoma de Madrid, L. Martin-Moreno of CSIC-Universidad de Zaragoza in Spain, J. Jung from the Aalborg University in Denmark, and L. Fok of SINAM.